Due to some hazy situations, there was no Purchase Decision last week. 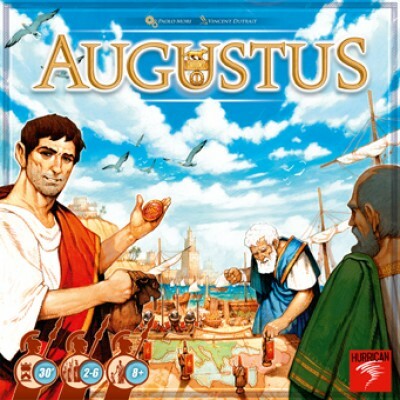 Augustus is designed by Paolo Mori and was recently nominated as one of the three challengers for the 2013 Spiel des Jahres Game of the Year award. Other designs by Paolo Mori include Batman: Gotham City Strategy Game, Vasco da Game and – a game I very much enjoy – Libertalia. Augustus has been described as Roman Bingo, and it is in most ways, extremely accurate. The game plays out very simply. Each turn, a mobilization token is drawn out of a bag at random. There are 23 tokens with unequal distribution. The token signifies the area in which each player may assign one of their legions ( workers ) to. This proceeds turn after turn and only differs when one or more players manages to complete an objective on that very turn. Each player that is able to do so immediately shouts ( as loud as you would like I guess ) “Ave Caesar !”. The player(s) will then execute any effects on the completed objective and then draw a new objective card from the five face-up available objectives. An objective is considered complete when it is fully occupied by a player’s legions. The main decisions that are involved in the game are the objectives that you choose to achieve and the various abilities or rewards that they give you once completed. Throughout the game, players will also be able to claim rewards from the general pool. These rewards range from owning different colored objectives to being the first to complete a certain number of objectives. Most rewards when won are yours to keep, except for a pair of rewards that are rotated among players based on who has the most of a type of resource ( something like the longest road in Settlers of Catan ). So this is done round after round until a player successfully completes 7 objectives, after which points are tallied up from completed objectives, end game bonuses, and reward cards, and the player with the most points is the winner ! I have a weakness for 6 player games. Any game that can handle 6 players is automatically on my radar as one of my usually regular groups come in 6s and with a strong unwillingness to split up. Augustus seems to be able to handle 6 easily as most things are done simultaneously, so it has piqued my interest in it very much. It is a small element in the game but I like the way it is implemented. The reward cards that you may claim based on number of objectives completed is limited to 1 per player. So if I claim the first to 5 objectives, I am unable to claim the first to 6 objectives should I also be the first to reach that mark. And you are not able to claim a lower level, so if I forgo the 5 objective card, I wont be able to get it again should I reach 6 and miss out on the 6 objective card. I like that very much. It may seem small but in games I have played with this mechanic, it makes you really decide how much you are willing to push. I love love LOVE the abilities on the objective cards. Ongoing / Permanent abilities – check. End Game Bonuses – check. Set Collection – check. Player Interaction – check. Engine Building – small check. Very Nice. I like that the game seems to be a quick game with still some interesting decisions to be made. The variability in the types of cards and how the tokens are drawn from the bag also ensure that each game is very likely to be different. I used to like this mechanic a lot, but after getting burned by it a few times in other games, it fell considerably on my nice mechanics chart. I’m not sure how badly it would affect the luck in this game, but for now I think I will say it’s a bad part of the game. This is the one point that might turn off a lot of my friends to this game. Way too much luck ? I personally don’t like the artwork of Augustus at all. Very cheesy and somewhat lazy maybe ? Don’t mean to be too harsh. The game comes in a standard square size box. But really, the components can be squeezed into probably one quarter the box size. It could be that the space is for future expansions, but really, when ( or if ) the expansion comes out, then you could sell it to us in a big box to hold everything. Not right now when it is absolutely unnecessary. I will be the first to admit that when I heard Augustus was nominated to be one of the three in contention to win the 2013 Spiel des Jahres Game of the Year award, I totally scoffed at the notion. I briefly read through its description and laughed at it being “Roman Bingo”. But after taking the time to read through the rule set, understanding the in-game abilities, and picturing how it might play out, I think I’m in for a surprise. It totally sounds like my type of game ! I am not sure if I will have to stand corrected on my initial impression of the game, but I am quite excited to find out.